Jean Michel Jarre might be laying off the lasers, the lightshows and the spectacular outdoor concerts, but he’s not letting his 63 years catch up with him: he has simply switched his ostentatious attentions to high-end iPhone and iPad docks. 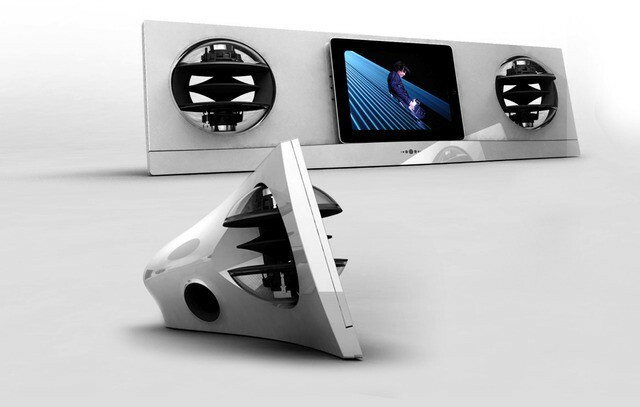 The latest is the AeroPad Two, a 30-pin dock connector-equipped behemoth of a home stereo which could probably shake your house to pieces. The AeroPad 2 is a huge 860mm (34-inch) surfboard of a device with a dock for anything from the iPod Nano up to the iPad. It will pump out your crappy, low bit-rate MP3s through four 30-watts speakers and one 80-watt subwoofer (if you’re wondering about where the subwoofer might be hidden, here’s a clue: that hump on the back doesn’t belong to Quasimodo). It will also accept a 3.5 inch jack, and if you happen to be packing a USB stick loaded with WMA, AIFF, WAVE or MP3 files on board, it can decode those, too. The rig weighs 10 kilos (22 pounds) and can be had in black, white or bamboo. One of the product shots shows the AeroPad with an iPad at its center, playing a movie. This seems improbable, unless you want to sit up close, right in the middle of the ear-bashing wind-tunnel this thing is likely to push out. How much does everybody’s favorite synth-happy Frenchman want for this monster? €700, or around $925.